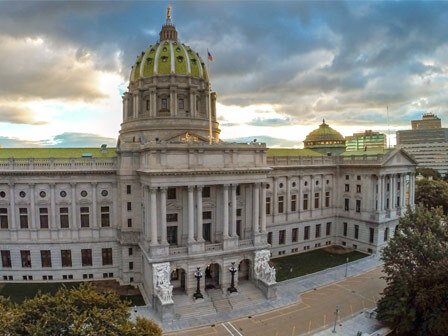 Built in 1906 by Philadelphia architect Joseph Huston, the Pennsylvania State Capitol located in downtown Harrisburg is a symbol of freedom and democracy. The Capitol building, often referred as a “Palace of Art,” has been praised by many, including former President Theodore Roosevelt, for its unique beauty and design. In honor of the Commonwealth, many of the rooms feature paintings, stained glass, and furnishings by local artists and craftsmen. The façade of the capitol was built using granite from Hardwick, Vermont, and atop the building’s dome is a gilded statue named the “Commonwealth” created by sculptor Roland Hinton Perry. The main entrance features bronze doors etched with scenes from the history of Pennsylvania, including the arrival of William Penn and his peace treaty with the Lenape. The Pennsylvania State Capitol currently houses the chambers for the Pennsylvania House of Representatives, the Pennsylvania Senate, and the Harrisburg chambers for the Supreme Court of Pennsylvania. The Capitol contains 475 rooms and has four floors, not including a mezzanine between the first and second floors, and a basement. Select areas of the Capitol complex such as the Main Capitol Rotunda, East Wing Rotunda, and Fountain are open to the public for special events, and guided tours are offered daily to visitors. A Welcome Center is also available at the East Wing featuring special exhibits and displays on the history of Pennsylvania.